Depicts the National Road - the first improved highway in the United States built by the federal government. 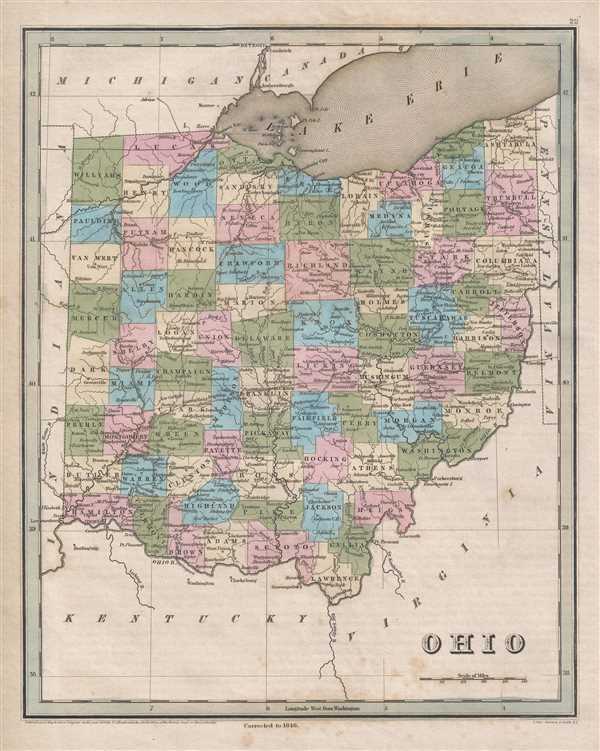 This is an 1846 Thomas G. Bradford map of Ohio. The map depicts the state in its entirety, from Michigan and Lake Erie to Kentucky and Virginia and from Indiana to Pennsylvania and Virginia. The National Road, also known as the Cumberland Road, traverses the state from Bridgeport and goes through St. Clairsville, Zanesville, Columbus, and Springfield, along with numerous other towns and cities. The National Road was the first major improved highway in the United States built by the federal government. Construction began in 1811 and was completed in 1837, connecting Cumberland, Pennsylvania with Vandalia, Illinois. A highly detailed map, the counties are all labeled and shaded different colors for easy differentiation. Myriad cities, towns, and villages are labeled, including Cleveland, Marietta, Cincinnati, and Columbus. Roads and railroads are illustrated, along with rivers and lakes. This map was engraved by Samuel Stiles and published by Thomas Bradford in the 1846 edition of his A Universal Illustrated Atlas, exhibiting a Geographical, Statistical, and Historical view of the World. Samuel Stiles (July 15, 1796 - April 3, 1861) was a New York based engraver of maps and bank notes active in the middle part of the 19th century. Stiles was born in East Windsor, Connecticut, and there served his apprenticeship as a line-engraver under self-taught master Abner Reed. In 1821, following his apprenticeship, Stiles relocated to Hartford, Connecticut, with is former master, Abner Reed, to form the firm of Reed and Stiles. Reed and Stiles worked in portrait, historical, landscape, and map engraving on wood and copper. Another former Reed apprentice, Pelton, joined the firm in 1822, changing the name of the firm to Reed, Stiles, and Pelton. Around this time, he also joined the Connecticut State Militia where he was commissioned as a corporal in the same Calvary regiment as his brother Asabel Chapin Stiles. In 1824 he relocated to Utica, New York, where worked with Vistus Balch, also a former Reed apprentice. Stiles and Batch moved to New York together in 1828 to found Balch and Stiles, banknote engravers. In 1833 Samuel Stiles partnered with Joseph Hutchins Colton, then a young man, to found Stiles and Company – Colton being the 'company.' This partnership lasted until 1836 when he and Colton published their great plan of New York City, known as the 'Colton Map.' Colton went his own way and became a major American map publisher. Stiles moved a few blocks away and partnered with George E. Sherman and Colin Smith to found Stiles, Sherman and Smith. The partnership dissolved in 1840 and Stiles took up again with J. H. Colton, who was already becoming prominent. In 1841, he joined the firm of Danforth, Ball, and Company, Bank Note Engravers. This firm eventually merged into the American Bank Note Company. In 1859 Stiles became a founding member of the National Banknote Company, which incorporated the American Banknote Company. He was the treasurer of this successful firm until his death in 1861. On a personal note, Stiles married the daughter of Abner Reed, Charlotte Sophia Reed, in 1825. Their son, Henry Reed Stiles attained fame of his own as historian and genealogist. Very good. Light soiling. Even overall toning. Blank on verso.